Professor Nigel Osborne and colleagues visited OLHS today to launch This place is our place, a project about Motherwell, past, present and future. The team are working with S1 pupils in Art and Design, Music and English to create poems, artwork and songs relating to their hometown. The next stage is for pupils to collect stories, images, sounds and mementos of life in Motherwell from their families that can be shared on the This place is our place website. Contributions are also welcomed from members of the public: please see the website for details. This place is our place is part of the Scottish Attainment Challenge. The annual Performing Arts/English trip to London was an action packed weekend from start to finish. 29 pupils joined Mrs Smith, Miss McGhee, Mrs Jeffrey and Mr Bryans on Thursday at teatime and the fun didn’t stop until Sunday at midnight! 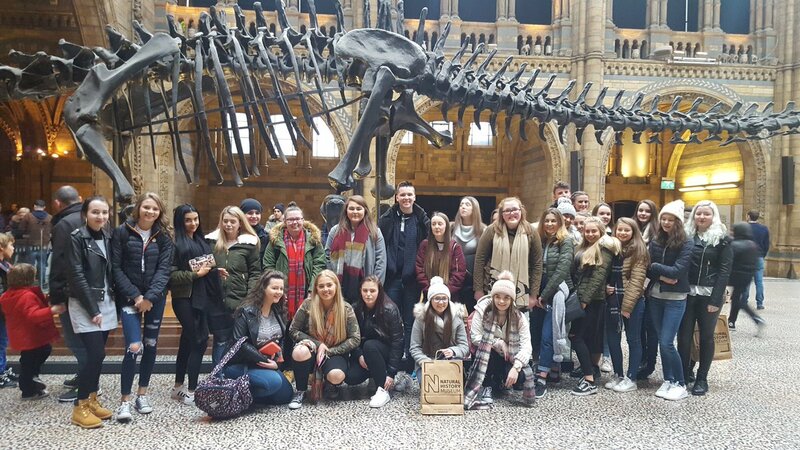 After collapsing exhausted on Thursday night from their journey, the group leapt into Friday action with visits to the Natural History Museum, the Victoria and Albert Museum and Covent Garden before enjoying a fantastic performance of Wicked. Saturday saw visits to Madame Tussaud’s, the London Eye and the Christmas market- but nothing compared with the London Dungeon, which was so terrifying the group started saying the school prayer. Sunday began with mass in Fulham, where the group was made very welcome by the Parish Priest and congregation before they hit the shops, including Harrods and Oxford Street. A tired but happy bunch returned to Motherwell at midnight on Sunday. The annual summer school at Our Lady’s High School took place on August 8th with twenty new first year pupils and four senior pupils enjoying four days of activities. The summer school allows the young people to become more familiar with the secondary school setting and to meet some of the school staff before the new term begins. Being more confident and self-assured at the start of secondary school gives the S1 pupils a positive step towards a successful transition from primary school. The S1 pupils took part in team building with the Partnership Staff on the first morning followed by a workshop of pottery with Ms Steinert where the pupils made clay hedgehogs in the afternoon. On Tuesday, the pupils learned to play the ukulele with Mr McVeigh followed by a session on how to create scars and bruises using special effects make up with Kirsty McCabe. On Wednesday, the pupils were treated to some Science experiments with Mr Law from Physics and after lunch, Mrs Smith from Performing Arts gave the pupils an opportunity to practice their voice and acting skills. On the final day, the entire group, Ms McDonald, Ms King and Mr Smith had a successful day trip to Blair Drummond Safari Park where they enjoyed seeing all the animals, especially the sea-lion show, and had some free time to explore the park. Show call backs took place on 8th December and were a roaring success. Pupils took part in singing of ‘Radio Ga Ga’ and a variety of acting scenes. Of the 120 pupils who auditioned, 40 were asked to return, and of that 40 the best fourteen gained main parts with the others gaining chorus roles. 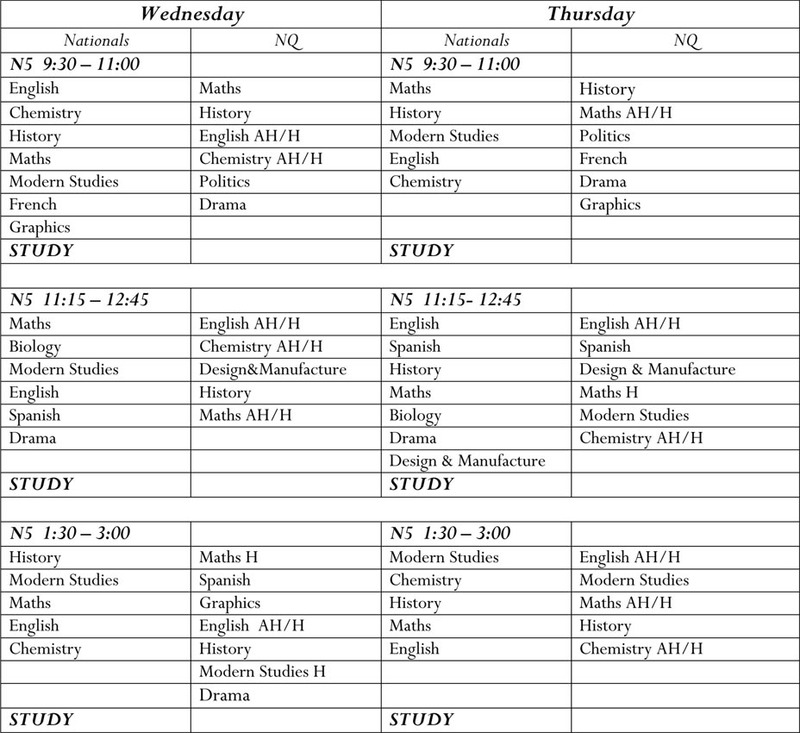 The finalised cast list of successful pupils will be placed on the show notice board in the Performing Arts Department. Well done and thanks to all who took part. 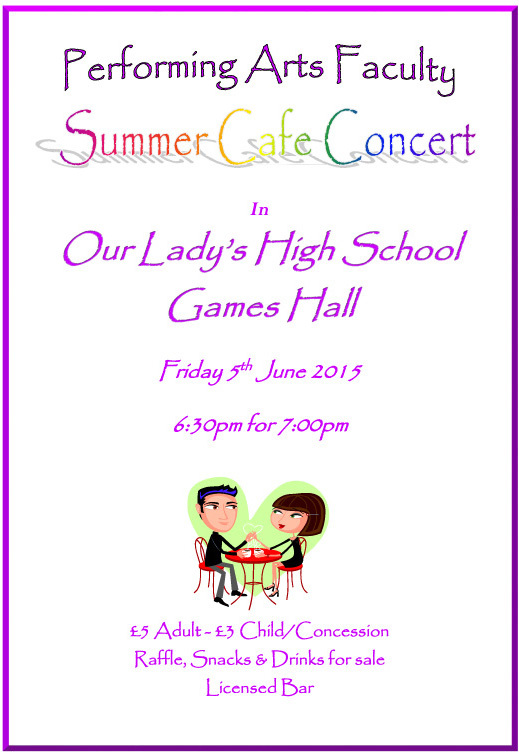 The Performing Arts Summer Concert will be held on Friday 5th June to raise funds for the school. The concert will take place in the Games Hall at 7pm with doors will open at 6.30pm. There will be a bar and raffle and the usual lovely nibbles and munchies! Tickets are £5 for Adults and £3 for Children / Concessions. Performing Arts Christmas Concert – Friday 19th December 2014. Tickets for the Performing Arts concert are now on sale from the Performing Arts base. The concert will take place in the school games hall on Friday 19th December at 7pm. Tickets cost £4 for adults and £2 for children and concessions. Please purchase your tickets as soon as possible to avoid disappointment. The Performing Arts Faculty are taking 60 pupils to see Wicked at the Edinburgh Playhouse in November. Wicked the musical is the background story of two witches from the Wizard of Oz, and how their friendship suffers through the demands of school and life. This year pupils are heading to London with Performing Arts in November. We are traveling by train to London Euston, visiting the London Eye, Natural History Museum and the Tate Modern. Pupils are very excited to see London and even more excited about the theatre trip on the Saturday night. The group are going to see Jersey Boys, a musical telling the history, and showcasing the songs of 1960s group, The Four Seasons. Any pupils wishing to participate in North Lanarkshire musical groups or ensembles, please pick up an application from the Performing Arts base, fill it in and return ASAP. Congratulations to all the staff and pupils to gave wonderful performances at our Spring Concert on 28th March. Groups playing on the night included the School Band, the Junior Band, the Choir, the Staff Choir, the Pipe drumming group, the brass ensemble, the string group and our Battle of the Bands group, Little White Truth. Many thanks to everyone in the audience who came along to support the performers. The Performing Arts Department is holding their Spring Concert on Friday 28th March. Come along and hear our fabulous young musicians, partake of our licensed bar and try your luck with the raffle. 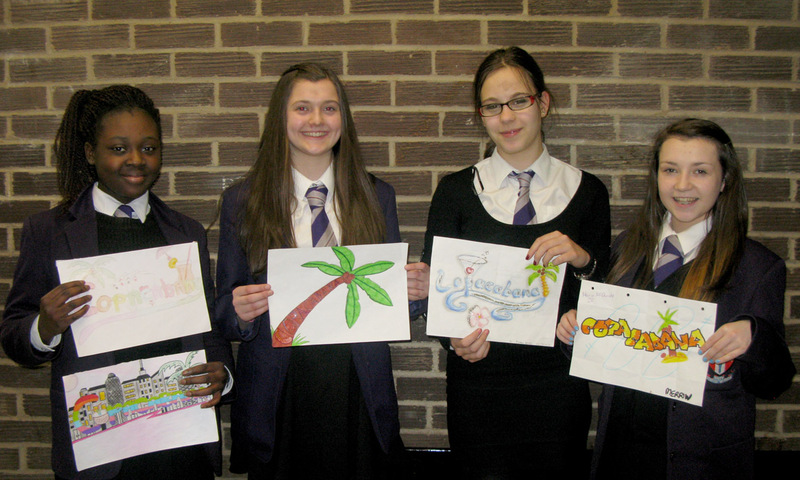 The Performing Arts Faculty invited pupils to design a logo for their forthcoming production of Copacabana. The standard of entries was extremely high and our congratulations go to 2nd year pupil, Piroska Horvath, whose colourful and elegant design was selected as the winner. Many thanks for all of the entries. Preparations are underway for a Spring/Easter Concert. Choir rehearsals are taking place every Thursday lunchtime wihle our fabulous Staff Choir continues their wonderful warblings on Wednesdays. School band continues Mondays after school as well as Junior band Monday lunchtimes. And this term we also have a revival of our string group which is rehearsing Wednesday lunchtimes as well. We are delighted that our entry to the Rockfest Battle of the Bands has been successful. Our band is called Little White Truth and they will be complemented this year with a four piece brass section. Pupils are rehearsing hard and looking forward to this amazing opportunity to perform at the fabulous Motherwell Concert Hall venue. It takes place on the 20th February at 7pm at the Motherwell Concert Hall. Our Lady’s has been allocated sixty tickets which are currently on sale to senior pupils from the Performing Arts base for £5. Pupils are busy rehearsing on a Tuesday and Thursday after school as well as an occasional lunchtime for the summer production of Copacabana. We are steadily working our way through combining Dance, Dialogue and Singing. The cast are now well gelled together and are thoroughly enjoying learning such vibrant, exciting music and dance routines. It is sure to be a huge success in June! This year we are also organising a logo competition for the show: The winning entry will be chosen to go on our show t-shirt. Entry forms are available from the show notice board in Performing Arts. All entries should be handed in to the Performing Arts base by Friday 21st of February. This year, Our Lady’s High School is proudly presenting ‘Copacabana – the musical’, with music and lyrics by Barry Manilow. The show runs from Tuesday 17th June until Friday 20th June 2014. We hope you will come along and support the pupils who have been working very hard to produce an excellent show. Anything Goes – got your tickets yet? A great show full of fun, comedy, brilliant Cole Porter songs and a dog. Performing Arts will hold their Summer Concert on Thursday 23rd May at 7pm in the Theatre. Doors open at 6.40pm. Tickets Adults £4, concessions £2. There will be a licensed bar and raffle.